Harp decals are removable so you can change them for the season, for the holidays or just for a different look. They won&apos;t damage the wood or the finish on your harp. And they last a very long time! 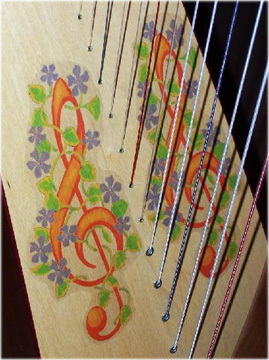 This pretty red/orange treble clef is entwined with periwinkle ivy, to add some bright color to your harp. Cheerful, colorful and musical! You will receive two decals, one for each side of your soundboard. The decal measures approximately 9 inches long by 4 inches wide.